Voting is the fundamental way that we exercise our right to self-government. Voter turnout is the basic measure of how many of us are exercising this right. By voting, we express our desires and set our priorities for less poverty, more jobs, a cleaner environment, less crime, and better education. When we vote, we fulfill an opportunity that few people have had throughout history, and for which people in this country and others have fought and died. 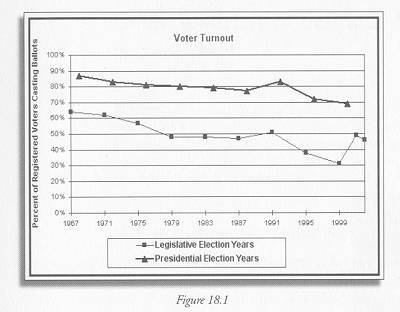 Figure 18.1 shows voter turnout in presidential and state legislative elections, respectively, from 1967 to 2000. (1) While turnout for presidential and gubernatorial elections is much higher than for state legislative elections, all voter turnout rates have declined. Turnout for presidential elections dropped from 87% in 1968 to 69% in 2000. Turnout for state legislative elections dropped from 64% in 1967 to 31% in 1999. This increase in registered voters may partly explain the dropping turnout rates, if voter turnout drives or motor voter register people who actually are not interested in voting. The steep decline in turnout for state legislative elections between 1995 and 1999 supports this hypothesis. However, while lowering barriers to voter registration is important, there are probably other causes of low voter turnout as well. (1) The state legislature turns over every two years, in odd years. This graph only includes the election years that were not gubernatorial election years, i.e. 1967, 1971, 1975, and so on.